River barge traffic slowly moves down the Mississippi River past the older Mississippi River bridge in Vicksburg, Miss., Thursday, May 19, 2011. For the second time in less than a week, barges drifted loose from a Mississippi River tugboat in Baton Rouge on Friday, hitting the same bridge struck in the previous incident  and highlighting the perils of allowing continued commercial traffic on this swollen, turbulent river. Though investigators have yet to determine the cause of the accident, veteran river pilots have said in recent weeks that the river's record floodwaters have simply made it harder to navigate. "The higher the river is, the harder it is because of the currents," says retired river pilot Charles Clasen, who was an apprentice pilot in 1974 when the river level in New Orleans rose to 19 feet  just a foot shy of the top of the levee. "If you're coming around a short turn and don't do it right in a low river, it's no big deal. In a high river, you can still recover, but you have to be out there paying attention. There's very little room for error." Earlier in the week, the Coast Guard closed a 15-mile stretch of river surrounding Natchez, Miss., because high water and wakes from passing barges posed a pressure risk on the levees there. 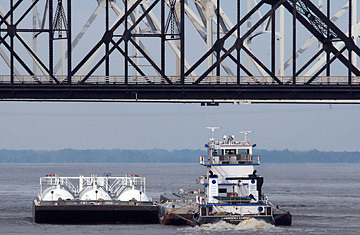 While the port in Natchez has been reopened, barge and tug traffic is now tightly regulated. In Baton Rouge, meanwhile, a five-mile stretch of the river has been closed until the Coast Guard deems it safe for transportation. "The Coast Guard is really between a rock and a hard place right now," Clasen says. "If they leave the river open and something bad happens  like a barge hitting a levee  then people will wonder why they didn't close the river. But if they close the river, then think about all the jobs it will impact around here and what it will do to the economy." A river closure from Baton Rouge to New Orleans could cost the U.S. economy at least $250 million a day, according to some estimates. "Losing this river is a serious threat," says Tulane University professor Eric Smith. The balance between levee safety and economic concerns have plagued every decision made about the Mississippi River in the past week. A week ago, when the U.S. Army Corps of Engineers grappled with whether to open the Morganza Spillway for the first time in 38 years, it was faced with the choice of risking catastrophic flooding in New Orleans if it did nothing, or with flooding the land of some 25,000 residents of Cajun country if it opened the floodgates. The Army Corps opened the spillway once the river flow reached 1.5 million cubic feet per second, and residents of Baton Rouge and New Orleans breathed a cautious sigh of relief as excess floodwater headed south down the Morganza to the Atchafalaya Swamp. Even as the Army Corps opened the Morganza, gate by gate, the river level held steady, but remained perilously close to the levee tops in both cities. Ship and barge traffic continued, although with the river flowing more than seven times the speed of the Niagara Falls, some questioned whether it should remain that way. The Army Corps and Coast Guard are currently walking a tightrope over river closure. Port of New Orleans spokesman Chris Bonura said the Corps had assured port officials that by diverting water through the spillways, they could keep river levels in the city below 18 feet. Anything higher than that would force a river closure. The levees protecting New Orleans are 20 feet high. If that seems to be cutting it close, port officials say the river can be kept open if proper travel restrictions are in place. Right now, the Coast Guard is asking vessels to go about 1 m.p.h. so that their wakes don't boost the already-churning currents. And, they're requiring barges to stay at least 180 feet from the levees as they work their way down the river. Despite the latest close calls in Baton Rouge, it's unclear how long the river will remain closed there, or whether the port in New Orleans will face a similar fate. "After a close call, when you sit down and your heart gets out of your mouth and goes back to where it belongs, you ask yourself, what could I have done to prevent that?" Clasen says, reflecting on his years working the river. "Sometimes you can pat yourself on the back. Other times you sit back and ask yourself, what if? Other times, you realize you can have all the skill in the world, but at the end of the day you were just plain lucky." With the Mississippi in its turbulent state, those making the call on keeping it open to traffic know that they can't rely on being lucky every time.